Two sonar manufacturers from the Pacific Northwest have joined forces in a cooperative effort aimed at improving efficiencies in aquatic habitat mapping. 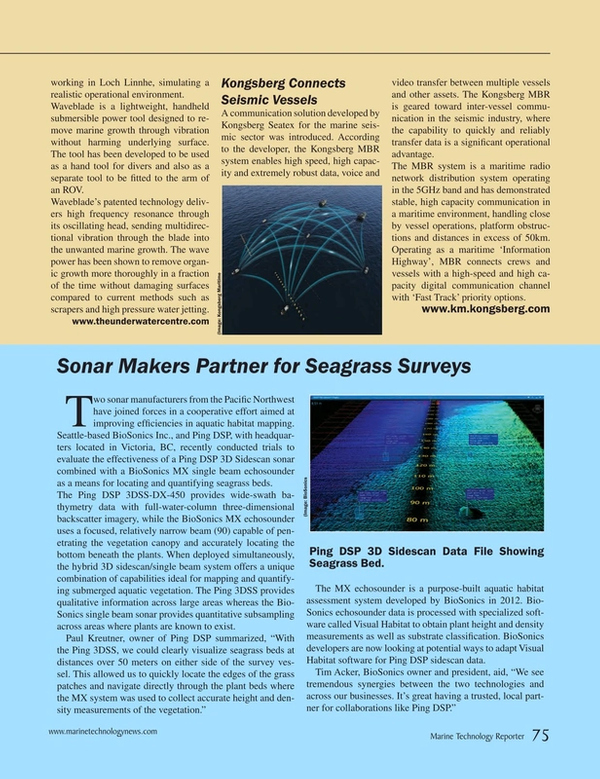 Seattle-based BioSonics Inc., and Ping DSP, with headquarters located in Victoria, BC, recently conducted trials to evaluate the effectiveness of a Ping DSP 3D Sidescan sonar combined with a BioSonics MX single beam echosounder as a means for locating and quantifying seagrass beds. The Ping DSP 3DSS-DX-450 provides wide-swath bathymetry data with full-water-column three-dimensional backscatter imagery, while the BioSonics MX echosounder uses a focused, relatively narrow beam (90) capable of penetrating the vegetation canopy and accurately locating the bottom beneath the plants. When deployed simultaneously, the hybrid 3D sidescan/single beam system offers a unique combination of capabilities ideal for mapping and quantifying submerged aquatic vegetation. The Ping 3DSS provides qualitative information across large areas whereas the BioSonics single beam sonar provides quantitative subsampling across areas where plants are known to exist. The MX echosounder is a purpose-built aquatic habitat assessment system developed by BioSonics in 2012. BioSonics echosounder data is processed with specialized software called Visual Habitat to obtain plant height and density measurements as well as substrate classification. BioSonics developers are now looking at potential ways to adapt Visual Habitat software for Ping DSP sidescan data.